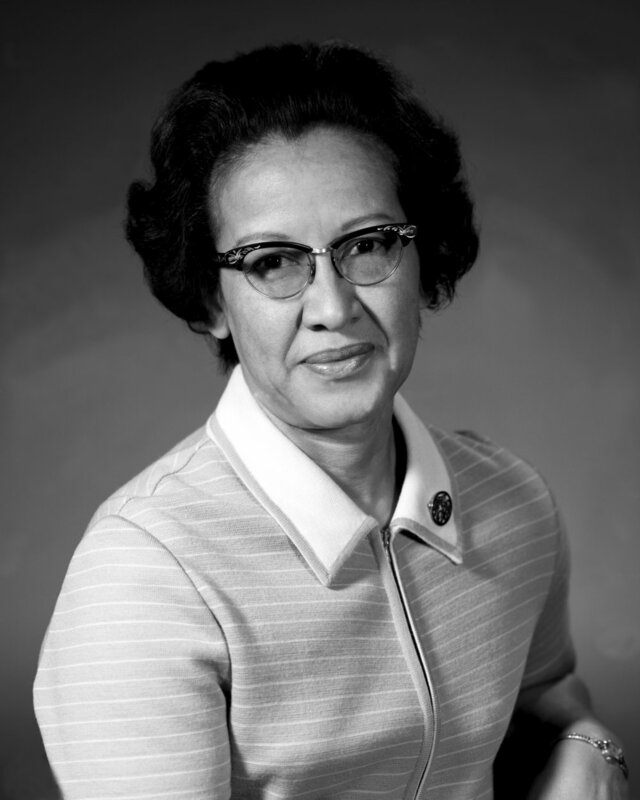 "Katherine Johnson is an African-American mathematician who made contributions to the United States' aeronautics and space programs with the early application of digital electronic computers at NASA. Known for accuracy in computerized celestial navigation, she conducted technical work at NASA and its predecessor, the National Advisory Committee for Aeronautics (NACA), spanning 35 years. During this time, she calculated the trajectories, launch windows, and emergency back-up return paths for many flights from Project Mercury, including the early NASA missions of Alan Shepard and John Glenn, and the 1969 Apollo 11 flight to the Moon, through the Space Shuttle program. Her calculations were critical to the success of these missions. Johnson also performed calculations for the plans for a mission to Mars. From 1953 to 1958, Johnson worked as a "computer", analyzing topics such as gust alleviation for aircraft. Originally assigned to the West Area Computers section supervised by mathematician Dorothy Vaughan, Johnson was reassigned to the Guidance and Control Division of Langley's Flight Research Division. It was staffed by white male engineers. In keeping with state racial segregation laws, and federal workplace segregation introduced under President Woodrow Wilson in the early 20th century, Johnson and the other African-American women in the computing pool were required to work, eat, and use restrooms that were separate from those of their white peers. Their office was labeled as "Colored Computers". In an interview with WHRO-TV, Johnson stated that she "didn't feel the segregation at NASA, because everybody there was doing research. You had a mission and you worked on it, and it was important to you to do your job ... and play bridge at lunch." She added: "I didn't feel any segregation. I knew it was there, but I didn't feel it." We needed to be assertive as women in those days – assertive and aggressive – and the degree to which we had to be that way depended on where you were. I had to be. In the early days of NASA women were not allowed to put their names on the reports – no woman in my division had had her name on a report. I was working with Ted Skopinski and he wanted to leave and go to Houston ... but Henry Pearson, our supervisor – he was not a fan of women – kept pushing him to finish the report we were working on. Finally, Ted told him, "Katherine should finish the report, she's done most of the work anyway." So Ted left Pearson with no choice; I finished the report and my name went on it, and that was the first time a woman in our division had her name on something. From 1958 until her retirement in 1986, Johnson worked as an aerospace technologist, moving during her career to the Spacecraft Controls Branch. She calculated the trajectory for the May 5, 1961 space flight of Alan Shepard, the first American in space. She also calculated the launch window for his 1961 Mercury mission. She plotted backup navigation charts for astronauts in case of electronic failures. When NASA used electronic computers for the first time to calculate John Glenn's orbit around Earth, officials called on Johnson to verify the computer's numbers; Glenn had asked for her specifically and had refused to fly unless Johnson verified the calculations. Biography.com states these were "far more difficult calculations, to account for the gravitational pulls of celestial bodies". Author Margot Lee Shetterly stated, "So the astronaut who became a hero, looked to this black woman in the still-segregated South at the time as one of the key parts of making sure his mission would be a success." She added that, in a time where computing was "women's work" and engineering was left to men, "it really does have to do with us over the course of time sort of not valuing that work that was done by women, however necessary, as much as we might. And it has taken history to get a perspective on that." Johnson later worked directly with digital computers. Her ability and reputation for accuracy helped to establish confidence in the new technology. In 1961, her work helped to ensure that Alan Shepard's Freedom 7 Mercury capsule would be quickly found after landing, using the accurate trajectory that had been established. Johnson co-authored 26 scientific papers. Her social influence as a pioneer in space science and computing is demonstrated by the honors she has received and her status as a role model for a life in science. Since 1979 (before she retired from NASA), Johnson has been listed among African Americans in science and technology. Johnson was named West Virginia State College Outstanding Alumnus of the Year in 1999. President Barack Obama presented Johnson with the Presidential Medal of Freedom, one of 17 Americans so honored on November 24, 2015. She was cited as a pioneering example of African-American women in STEM. On May 5, 2016, a new 40,000-square-foot (3,700 m2) building was named Katherine G. Johnson Computational Research Facility and formally dedicated at the agency's Langley Research Center in Hampton, Virginia. The facility officially opened its doors on September 22, 2017. Johnson attended this event which marked the 55th anniversary of astronaut Alan Shepard's historic rocket launch and splashdown, a success Johnson helped achieve. At the ceremony, Deputy Director Lewin said this about Johnson: "Millions of people around the world watched Shepard's flight, but what they didn't know at the time was that the calculations that got him into space and safely home were done by today's guest of honor, Katherine Johnson". During the event, Johnson also received a Silver Snoopy award; often called the astronaut's award, NASA stated it is given to those "who have made outstanding contributions to flight safety and mission success". In 2016, Johnson was included in the list of "100 Women", BBC's list of 100 influential women worldwide. NASA stated, "Her calculations proved as critical to the success of the Apollo Moon landing program and the start of the Space Shuttle program, as they did to those first steps on the country's journey into space." Johnson has been portrayed in the media. In a 2016 episode of the NBC series Timeless, titled "Space Race", the mathematician is portrayed by Nadine Ellis. The highly acclaimed December 2016 film Hidden Figures, based on the non-fiction book of the same title by Margot Lee Shetterly, follows Johnson and other female African-American mathematicians (Mary Jackson and Dorothy Vaughan) who worked at NASA. Taraji P. Henson plays Johnson in the film. Johnson appeared alongside Henson at the 89th Academy Awards. In an earlier interview, Johnson offered the following comment about the movie: "It was well-done. The three leading ladies did an excellent job portraying us."